Tagline: "Living the Dream, One Heist at a Time"
It was between the months of October 2008 and August 2009 that a group of southern California teenagers broke into the homes of several celebrities, making off with about $3 million in cash and property. Among the houses targeted were those belonging to Paris Hilton, Lindsey Lohan, Orlando Bloom, and Rachel Bilson. In fact, according to reports, the teens entered Paris Hilton’s home on eight different occasions, and Rachel Bilson’s somewhere between three to six times, taking just enough to satisfy their greed, but not nearly enough to alert either of the big-time celebs that anything was missing. Often, the thieves would use the money they stole to hang out at the very nightclubs their victims frequented, and what’s truly ironic is that, once the youths were arrested and put on trial, they themselves became as famous as the personalities they ripped off. The media dubbed the teenage crooks the “Bling Ring”, which is also the title of the 2013 Sofia Coppola film that chronicles this bizarre crime spree. During his first day at a new high school (for teens who have been kicked out of their previous school), Marc (Israel Broussard), the fashion-conscious yet lonely son of a Los Angeles film distributor, meets Rebecca (Katie Chang), an outgoing young woman with dreams of becoming a fashion designer. Before long, the two are inseparable, and while hosting a party one night, Rebecca introduces Marc to her favorite pastime: stealing wallets from unlocked cars. Soon after, these best pals up the ante by breaking into a house belonging to a friend of Marc’s, who was out of town at the time. This particular robbery nets them several thousand dollars in cash, which they use to go on a shopping spree. While perusing the internet one afternoon, Marc stumbles upon a news article saying Paris Hilton is scheduled to attend a party later that evening. Rebecca asks Marc to find out where Ms. Hilton lives, and that very night, the two are hanging out in her home (thanks to a key left under the doormat), stealing a handful of Hilton's belongings and admiring her “Club Room”. The duo eventually tell their inner circle of friends, including hip-hop bad girl Chloe (Claire Julien), supermodel wannabe Nicki (Emma Watson), and Nicki’s adopted sister Sam (Taissa Farmiga), about their misdeed. Soon, the three are begging Marc and Rebecca to take them to Paris Hilton’s house. It was the first of many celebrity homes this group would break into, and before the law finally caught up with them, they had swiped millions from some of Hollywood’s biggest stars. 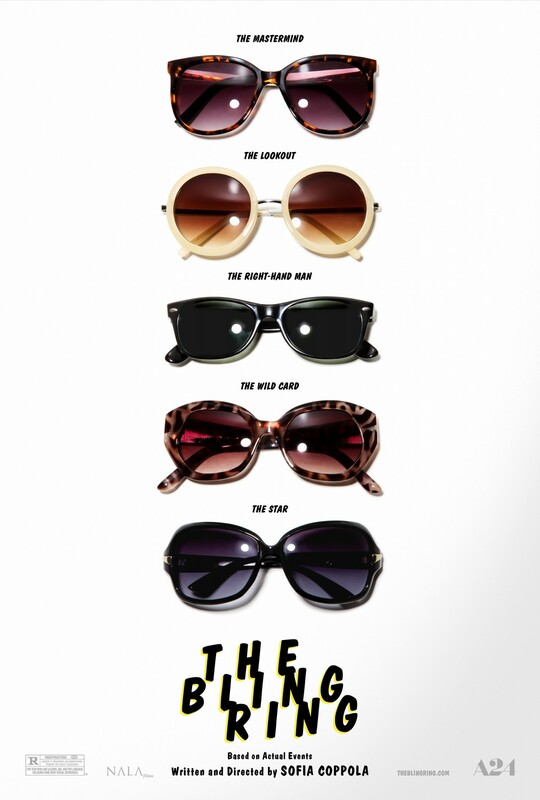 The Bling Ring works quite well as a crime thriller; we tag along with the teenage thieves on their various excursions, and watch as they turn Paris Hilton’s home into their own private retreat (dancing in her club room, trying on her shoes, and stealing bits and pieces from her large jewelry collection). Many of these scenes were shot in Paris Hilton’s actual house, in the rooms that the real Bling Ring had invaded, and the only thing more shocking than the lead character’s behavior is the decadent lifestyles of their victims (along with her Club Room, Paris Hilton has an entire wall filled with framed copies of the magazine covers that featured her, as well as a shoe closet that’s bigger than a studio apartment). But, even more than the money, it was these very lifestyles that attracted the members of the Bling Ring in the first place. Most criminals would lay low after committing a high-profile robbery, but not the kids in this film. Instead, they use the stolen cash to gain access to L.A.’s best hotspots, where they often wear the designer clothes they recently swiped! As we see time and again throughout The Bling Ring, the high they get fraternizing with the rich and famous is what drives these teens to steal even more, and it isn’t long before they themselves are as out-of-control as Lindsey Lohan and some of the other celebs they’re burgling. Coppola assembled an excellent cast for The Bling Ring, especially Katie Chang and Israel Broussard, who portray the ringleaders of the whole sorry affair. Topping them all, however, is Emma Watson as Nicki, the most clueless of the bunch (when arrested, she tells the press she’s viewing this entire ordeal as a “learning experience”, and is more than happy to talk whenever a camera is pointed in her direction). These young actors do more than bring their characters to life; they actually make us understand their motivations (the desire to stand out in a town jam-packed with celebrities), and for a film of this nature, that’s no small feat. 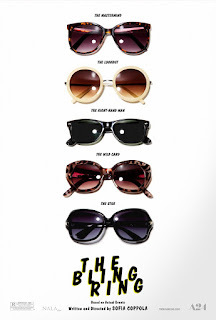 The Bling Ring is yet another feather in Sofia Coppola’s cap, a motion picture every bit as stylish as it is disturbing. Yet for me, the film’s biggest accomplishment is that it shines a light not only on the crimes of its main subjects, but also the media in general, whose obsession with the rich and famous is as warped as the real-life figures that inspired this movie. With news outlets that now focus on celebs and Hollywood gossip 24 hours a day, seven days a week, there’s a chance that the events depicted in The Bling Ring will happen again, and that is ultimately more troubling than the theft of a few million dollars from people so obscenely wealthy that, for a time, they didn’t even realize they were being robbed!